What is the difference between comfort and non-comfort fit rings? How does script and block engraving look? You can request a free ring sizing kit from us, by clicking Here. We highly recommend requesting our kit to get the best size based on our measurements. If you do not have time to receive the kit, an alternative is to go to a local jeweler and get your ring finger sized. Here are a few tips to keep in mind to make sure you are getting the correct size. Remember that WeddingBands.com does offer quarter sizes so take that into consideration when trying on the sizing kit. Look at the ring that fits you best and personally read the size marked on that specific ring, i.e. Marked 6 (is size 6) or marked 6- or 6 1/2 [is size 6.5]. Try on a few rings in the store, particularly ones that are the same millimeter width and similar style, if possible. A band 8.0mm wide or wider may require a quarter [1/4] size increase to ensure the correct fit. We recommend trying on both a comfort fit and a non-comfort fit to see the difference, and to find your preference. There are a few things to keep in mind when trying to size your ring perfectly The ring should go on easily. The ring should feel comfortable on your finger. It should come off with a little resistance. If you think you're between our half sizes, don't fret, we offer quarter sizes on all our rings on WeddingBands.com. We do offer quarter sizes for individuals with in between ring sizes (i.e. 7.25). You can select the sizes while looking at the products. I know my ring size in an international measurement. How can I convert it to American measurements? We have a helpful International Sizing Chart to help convert your measurement to our American measurement. The chart is located under Information, on the bottom / footer of the page. Click on Ring Sizing Chart , and convert your international size to our standard size. If the wedding ring you ordered does not fit your finger size, you can return it once within Thirty (30) days from the date shipped to be sized or exchanged for the proper size. Just specify your correct finger size. If you need a size change after the thirty (30) days, you can still get the correct size but there may be an additional charge. You always have the ability to get the ring sized at any time. Do you service your ring(s) in terms of sizing, refinish, or re-rhodium? Yes, we would be happy to refinish or re-rhodium plate your ring at anytime of the life of the ring. There is no additional charge on refinishing or re-rhodium plating your ring(s). The only fee you pay is the return shipping. You can use this service anytime throughout the life of the ring. Feel free to contact us for a return authorization number (RMA) and we would be happy to service your ring(s). We, also, know throughout the years our fingers may change and may need an adjustment. WeddingBands.com is happy to size your ring(s) at anytime of the life of the ring; even after the 30-day return/exchange timeframe. Feel free to contact us for more information on sizing your ring. Why do some of your rings take longer to deliver? We manufacture every ring to order to ensure you get a ring that's new and never been worn by anyone. You wouldn't go to a restaurant expecting to be served something that's been sitting out for display. You shouldn't with your wedding ring either. After all you're paying for a ring that will be YOURS forever, and not for something that's been sitting in a warehouse or jewelry store for months being tried by dozens of people. To help you better plan the time needed for your ring to be manufactured, please use the following guide. Plain Rings take 1-2 business days to manufacture. Handcrafted, classic, hand-carved, and diamond wedding rings take 4-6 business days to manufacture. Designer and contemporary can take up to 7 business days to manufacture. What metals do you use to manufacture rings? We manufacture our rings using a variety of materials and continue to look to offer even more variety. As of now, we offer 14 KT white and yellow gold, 18 KT white and yellow gold, platinum, palladium, titanium, tungsten, cobalt chrome, and combinations. If you have any requests about a ring style that you would like in a different metal, please contact us. We'll be more than glad to help you with all your requests. Are any of your rings hollow or plated? None of our rings are hollow or plated. We manufacture using solid materials, and pride ourselves with using the finest material, and newest manufacturing techniques to bring you the highest quality product for the lowest price possible. What is the difference between polish, brush, and matte finish? 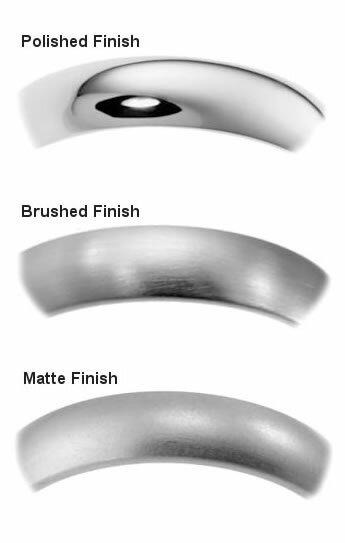 You can find a sample of the different finishes here: Ring Finishes. At WeddingBands.com, we can finish the ring in three different ways. The polished finish is shiny, reflective, and glossy. There are no marks on the band and the metal is polished to a reflective shine. The brush finish has a textured finish; which look like tiny-brush like marks on the ring. It is not a shiny finish and has a dull look. The matte finish is a satin and smooth finish. It is dull and looks like fogged up window. You will not have any reflective look. What is the diamond quality used in the rings? At WeddingBands.com, we use the finest quality diamonds. We use diamonds that are cut to the maximum brilliance. The clarity in all of our diamonds are VS1-2 and the color is G-H.
Where can I make a suggestion on a ring I want? At Weddingbands.com, we would like to make your jewelry purchase as comfortable as possible; it is for this reason that we added a Wish List. You can also email Customer Service at CustomerService@Weddingbands.com You can use this Wish List to make suggestions on both wedding rings you have seen on our online store, and products you would like to see. We also allow you to use this tool to make suggestions about our website. On every ring we manufacture we offer FREE USPS USA Shipping, which can take 2-6 days depending on where you live in the United States. We also offer additional service levels including: USPS Express, USPS Priority, USPS Express USA Saturday, Canada, Europe, International, and USPS Military APO/AE (Free). Other shipping requests are handled on a per order basis and additional charges may apply. How long does it take to receive a shipped package? Please consult the following chart to know how much time it will take to receive your ring if you decide to do FREE USPS USA Ground Shipping. WeddingBands.com wants to insure the order is delivered directly to you or the individual you approve to receive the package. As a manufacturer and seller of items made with precious metals and gemstones, we have a legal and ethical responsibility to sell and deliver to verifiable end-users. We also take our obligations to you, our customer, for the trust you have placed in us with your personal information very seriously. Your protection is our protection and vice-versa. Please Note: We can ship to a United States Postal P.O. Box - if this P.O Box is the Credit Card Billing Address. Also due to the value of the goods we ship, we always ship insured and require a signature. Because of this we require a signature for all our deliveries. Yes. We ship to a wide range of countries around the world. We mainly deal with countries in Europe and North America; as well as countries like Australia and New Zealand. Please be aware that you are responsible for any duties and taxes applied by your country. Since this varies between countries and changes frequently, we can only provide estimates of the duties and taxes. If you are not sure about delivery to your country, please feel free to email our Customer Service at CustomerService@WeddingBands.com. We will gladly answer any questions about international delivery. Why can't my order be left in a mailbox or at the doorstep? Doing either of those things creates an extremely unsecure situation for the package. If you need to make other delivery arrangements, then please contact WeddingBands.com at (888) 422-4333 or email us at CustomerService@WeddingBands.com . We will gladly assist you in finding the best way to deliver your order. You can call the delivery service and make arrangements to pick up your package. The carrier will make several attempts to deliver your package before sending it back to us. To check the status of the order just click on the Order Status either in the top, right hand corner of the web page or click on the blue hyperlink in this text. Put in your order number and email address into the fields given. 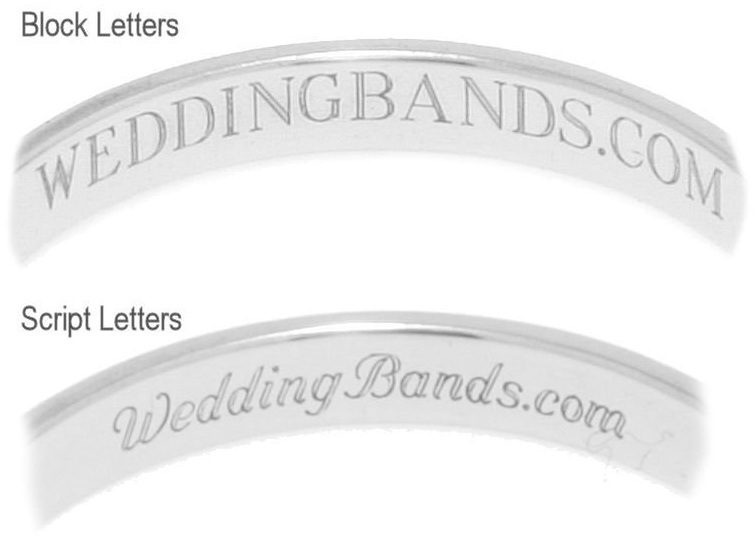 You can then view your order status or you can email Customer Service at CustomerService@WeddingBands.com. We would be happy to provide you with an updated status of your order. How can I track my order, while it is being shipped? Click on the Order Status link, either at the top right hand corner of the web page or the blue hyperlink in this text. The tracking number will show in the order status update. You will also have an email sent containing the tracking number once your order has been shipped. Put in the tracking number that we emailed you or from order status update into the appropriate tracking site. If you are missing any information on your order, please email us at CustomerService@WeddingBands.com and we will gladly assist you. How long will it take for me to get my ring once I order it? We promise to make every effort to get your ring to you in a prompt manner. Plain gold, plain platinum, and plain palladium bands can be manufactured very quickly with a turnaround time between 2-3 days. However, certain sizes, materials and handmade wedding rings require 5-7 working business days to manufacture. Shipping time will be in addition to this manufacturing time and does not include weekends. If any delays occur during the manufacturing process, we will contact you as soon as possible. When planning your order we suggest planning for the manufacturing time, along with the shipping time, which you can choose from our many options. Also, if you are not sure if the ring will be made in time for your event date, please feel free to call our Customer Service at (888) 422-4333 or email us at CustomerService@WeddingBands.com. We will provide you with a give you a better estimate on delivery. Please refer to our Delivery Transit Chart, located in our Delivery page. You can find the link under the Information bar located on the bottom / footer of the page. WeddingBands.com sent me the wrong sized ring, what should I do? Email the Return Authorization Department at RMA@Weddingbands.com or call the Customer Service Department at (888)-422-4333, explain the situation and we will email you an RMA number and instructions for sending it back for the right ring. Karat is simply used to indicate the purity of gold. Gold is actually a mixture of gold and other metals. 24-karat (24K) is 99.9% pure gold, 18-karat (18K)is 75% pure gold, and 14-karat (14K) is 58.33% pure gold. For more information about gold or other precious metals, click on the Precious Metals link located under the Information / Education menu on the botton / footer of the web page. The term carat is used to measure the weight of a diamond. Further knowledge of this can be found under the "How to Buy Diamonds" article. This article is located in the Information / Education section, located on the bottom / footer of the page. Just click on the link titled "How to Buy Diamonds." No. White gold, is yellow gold with added alloys to give it a white appearance. We offer 14-karat and 18-karat white gold, which means that either 14 or 18 parts of the actual metal, out of a total of 24 are gold. The rest of it is a mixture of alloys that gives the gold a white color. Most white gold has a rhodium plating to create a more lustrous white color like platinum. This process has become a standard in the jewelry industry More information concerning our rings or precious metals can be found on our About Our Rings and Precious Metals page. Just click one of the links. The 4C's are Cut, Color, Clarity, and Carat. A further description of these 4 characteristics of diamonds can be found in the "How to Buy Diamonds" located under Information / Education on the bottom / footer of the page. Just click on the link.